On behalf of the prisoners of the Popular Front and the Palestinian prisoners’ movement, I extend our greetings and salutes to all those organizing for freedom for Georges Ibrahim Abdallah as he enters his 35th year inside French colonial jails. 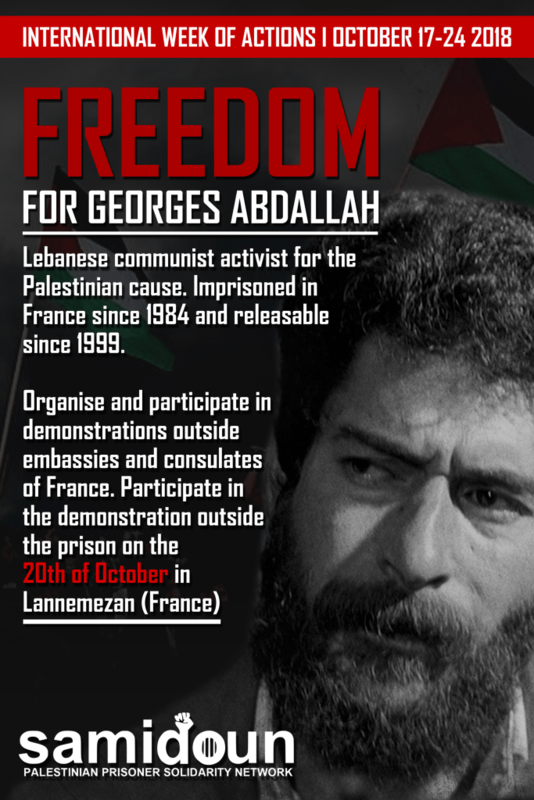 In particular, I urge the Palestinian and Arab masses and their liberation movements and all friends of Palestine and our struggle around the world to join in the Week of Action to Free Georges Ibrahim Abdallah, from October 17-24, organized by Samidoun Palestinian Prisoner Solidarity Network and the international campaign to free Georges Abdallah. We urge all to march in Lannemezan on 20 October in the national march organized by the tireless comrades who struggle, day in and day out, for the freedom of comrade Georges and our freedom in Palestine. For us, inside Israeli prisons, Georges Abdallah is a fellow struggler and a fellow Palestinian prisoner. We call him “the General of the prisoners of the PFLP.” He is part of us – one with us in unity and common struggle. We feel his support and participation in our struggle across seas and through iron bars and prison walls. He returns meals with our hunger strikes, his heart beats for Palestine just as his politics centers its liberation, and he has spent decades imprisoned because of his commitment to the liberation of the Palestinian and Arab people. 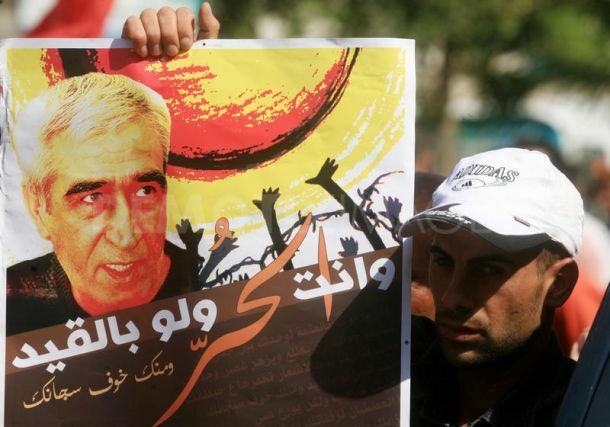 Indeed, Georges Abdallah is an icon of resistance. With his clear analysis and involvement in all struggles for justice inside France and around the world, he refuses all attempts to isolate and silence him. His case also shows quite clearly just how strongly U.S. and French imperialism are tied to Zionism and the colonization of Palestine. Just as the French state celebrates with the war criminal Netanyahu to inagurate a “France-Israel season” as his troops shoot down our people in Gaza as they march in the Great March of Return, we know that this is the same France that slaughtered 1.5 million Algerians in its colonial wars in the Arab world. And just as the people of Algeria defeated French colonialism after paying the highest price in blood and sacrifice for their freedom, we know that Georges Ibrahim Abdallah will win. And as the United States – itself a colonial settler state built on the genocide of Indigenous peoples and the enslavement of Black people – attempts to liquidate the Palestinian cause, erase our fundamental right to return and label our resistance as “terrorist,” it has repeatedly interfered to keep Georges Abdallah behind bars. From Condoleeza Rice to Hillary Clinton, consecutive Secretaries of State have demanded that our beloved freedom fighter be kept behind bars. Of course, this is no surprise. Imperialism and Zionism stand together to construct prisons, walls and war machines. From Greece to the Philippines to Turkey, political prisoners put their bodies on the line to fight back against capitalism and imperialism. In the Arab reactionary regimes that stand hand in hand with the United States, from Saudi Arabia to Morocco, we hear the calls of our fellow political prisoners, demanding justice and liberation. Between October 17 and 24, raise your voice against this injustice. Take to the streets, organize and act to demand freedom for Georges Abdallah and all political prisoners. The Palestinian prisoners are with you – we shout for the freedom of our comrade Georges Abdallah from the depths of the Zionist dungeons. Together, we can win the freedom of this beloved comrade, a leader of the Palestinian, Arab and international struggle for socialism and liberation. To stand with Georges Abdallah is to stand with the resistance, the Palestinian people and all those political prisoners struggling for freedom. 2. Join the broad national protest in Lannemezan on 20 October. Every year, hundreds arrive to demand George’s freedom, raising a call so loud the prisoners can hear us inside. Don’t miss this year’s action! 3. 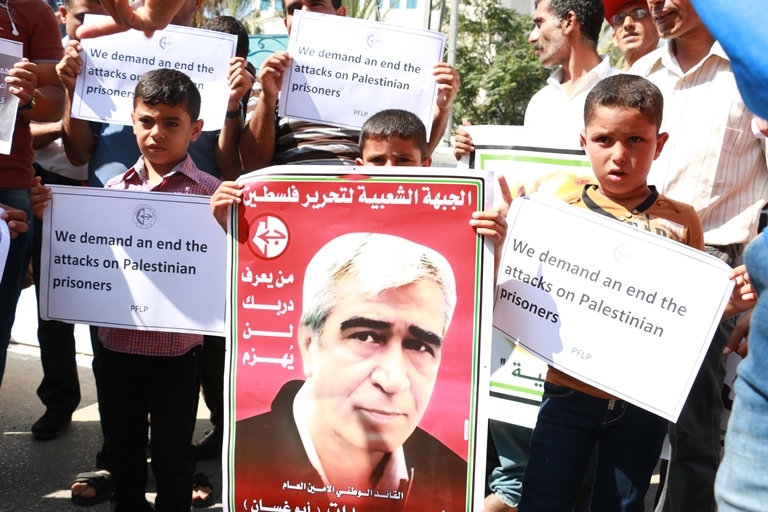 Distribute this call to action and take media actions, like posting photos with posters calling for freedom for Georges Abdallah and other Palestinian prisoners. Manchester: Victory to Palestine! Free Georges Abdallah! Gothenburg: Victory to the Palestinian liberation struggle!